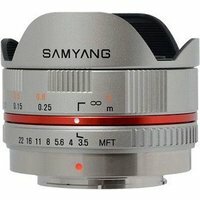 The Samyang 7.5mm f3.5 UMC Fish-Eye Lens Black is a dedicated fish-eye lens for use with the Micro Four Thirds system. The unique focal length of 7.5mm provides a 180 degree angle of view, making it a great tool for panoramic photographs. UMC stands for Ultra Multi Coated, which indicates that the lens has been covered with multi-layered, anti-reflective coating which minimises reflections and increases image contrast. This 7.5mm Fish-Eye lens provides you with an extremely wide field of view, which is great for landscapes, band shoots and travel photography. Offering the highest quality optics packed in a compact form, the Samyang 7.5mm Fish-eye lens is the first model from the new family of lenses developed specifically for the Micro Four Thirds system. This lens is a manual focus lens and does not autofocus (AF).